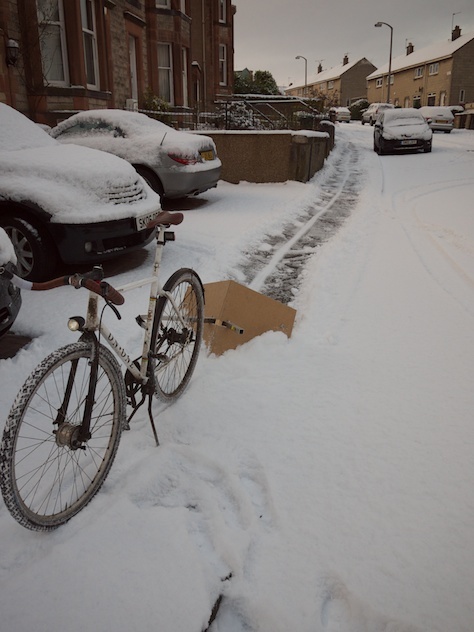 Ever since I read about David Peterson’s bike plough I’ve fancied building one myself – Edinburgh Council being as loath to treat the streets as it often seems to be. This mk1 version is incredibly basic yet does a pretty solid job. At first I just cut the holes in the leading edge for the ‘Y’ part of the frame (above), but then cut holes for the trailer’s axles to keep the plough at a fixed angle (otherwise it would dig in and the tail kick up). 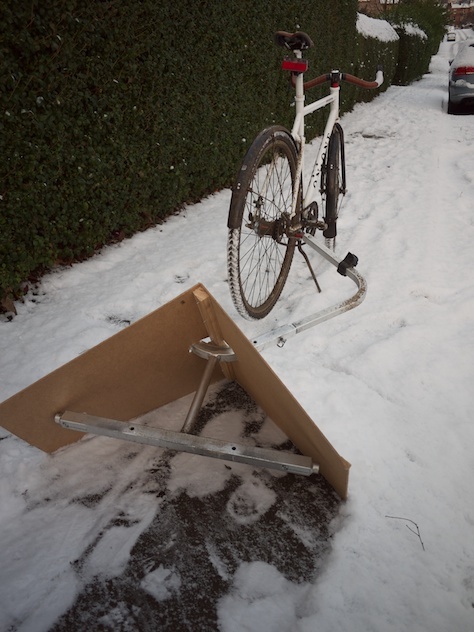 Obviously it won’t last – the board already looks pretty scuffed after just a mile or so, and will swell up if it gets soaked; but who cares, it’s scrap. v2 will be much better. If you fancy giving this a go yourself, Chain Reaction Cycles are selling both large and small Y-Frame trailers at a large discount. 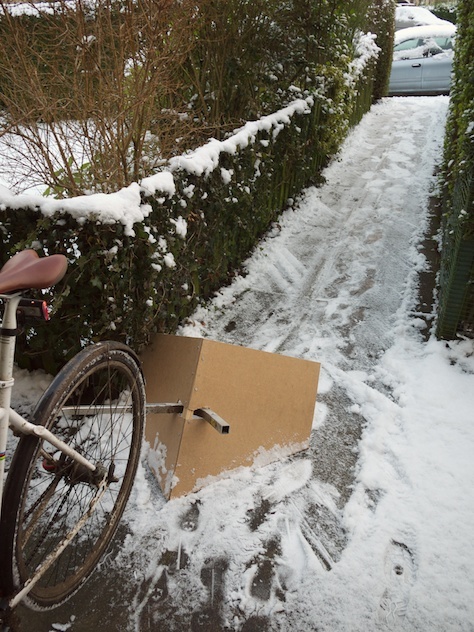 For those of a delicate persuasion, look away… I’m an evil pavement cyclist now! 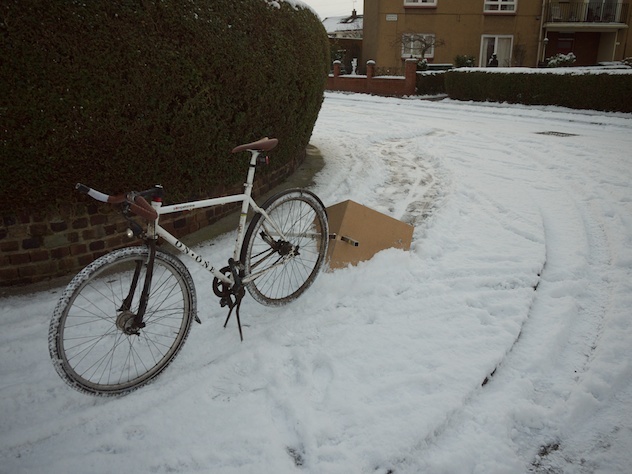 Amazingly little effort is needed (although it’s a light fall) – I was able to ride uphill with the plough no bother. 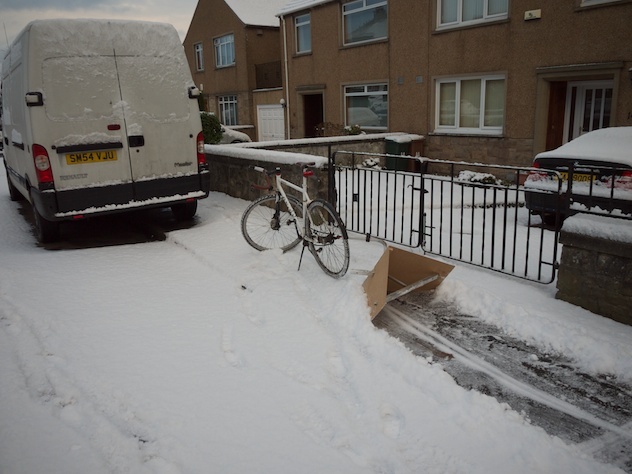 Of course, it didn’t take too long to find people carelessly obstructing the pavement… this is Edinburgh! I really want one of these…..